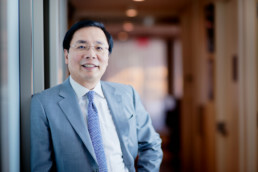 With 20 years of experience, and as a clinical professor of Neurology at Weill Cornell Medical College, Dr. Sun is a leader in his field. If you’re experiencing symptoms like headaches, numbness, neck or lower back pain, double vision, dizziness upon standing up or quick movements, unbalanced gait, focal weakness, memory loss, loss of feeling or numbness in extremities, and being easily fatigued, consult a neurologist right away. Neurology is the branch of medicine that deals with the nervous system and the treatment of diseases and disorders that affect it. Some of the conditions that are associated with the field of neurology are multiple sclerosis, migraine headaches, brain tumors, epilepsy, stokes, aneurysms, muscular dystrophy, spinal disorders, and peripheral nerve injury. Because the nervous system affects many parts of the body, Dr. Sun also cares for patients with complex illnesses, such as cancer and diabetes. Who could benefit from a neurological consultation? Patients who are seeking healthcare consultation or experiencing symptoms like headaches, numbness, neck or lower back pain, double vision, dizziness upon standing up or quick movements, loss of feeling or numbness in extremities, and constant fatigue, would benefit from a consultation with Dr. Sun. One on one consultation with Dr. Sun for 45 minutes. Please bring any related scans, or medical records that are important regarding your case. When no other doctors could tell me what was going on, Dr. Sun was the one who diagnosed me and carefully crafted a comprehensive treatment plan with a team of physicians. I feel so lucky to have found him! If you want to find a doctor who actually listens to you and takes the time to coordinate the best care for you, go to Dr. Sun. I’ve sent my parents to Dr. Sun and now I’m seeing him too! I’ve been going to Dr. Sun for the past 20 years and there’s a reason that I can’t leave him and his practice. Dr. Sun is not just my doctor, he saved my life. He’s the only doctor I refer anyone to go to for anything. I came to him with a heart issue and he still was the most effective doctor I went to.